Meet the Community Science Team! Americans alone use a whopping 500 million straws each day and 5 billion plastic bags each year, which adds to the estimated 17 million tons of plastic that enters the ocean every year. The Ocean Friendly Establishments certification program was created to reduce single-use plastics along the coast of North Carolina, with an initial goal of tackling plastic straw use by urging restaurants to only offer straws upon request. 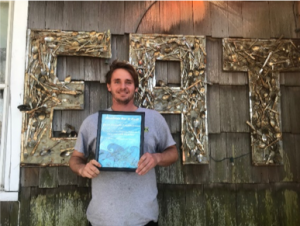 Originally started by Plastic Ocean Project, Inc. and the Cape Fear Surfrider Chapter in Wilmington, NC, this program has since expanded to a coast-wide effort in our state. As an ambassador for the Plastic Ocean Project, I am involved in the Ocean Friendly Establishments program on the Crystal Coast and Outer Banks areas, and I work with our awesome partners at Jennette’s Pier, Bogue Banks and Outer Banks Surfrider Chapters, Crystal Coast Waterkeeper, and Sierra Club Croatan Group. One issue this program has started to address is plastic bag use. I was in high school when the Outer Banks bag ban went into effect, which I remember being pretty controversial—it was the first ban of its kind in the state. Most businesses adapted quickly to the change, recognizing the value of their commitment to reduce plastic and that this simple change has tremendous impact on the health of our environment. Recently, the plastic bag ban implemented on the Outer Banks ten years ago was repealed. Despite what many locals and passionate advocates wanted, the ban was lifted, and businesses could go back to using plastic bags. However, many businesses weren’t convinced plastic was the answer and continued to offer only paper or reusable bags to their customers. To formally recognize these businesses and persuade others to not use plastic bags, the Ocean Friendly Establishments program was expanded from straw use at restaurants to plastic bag use at any establishment, including retailers. The response we’ve gotten so far is incredible. 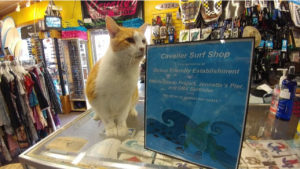 After a whirlwind of certifying 20 new Ocean Friendly Establishments in just over one week on the Outer Banks, businesses are now approaching us with interest of becoming certified. Their enthusiasm and support for this program is humbling, as is their commitment to protecting our beautiful coast. Growing up on the Outer Banks inspired my passion to protect coastal ecosystems, and it is so fulfilling to work with like-minded people that sincerely want to make a change! Home About Meet the Community Science Team! © 2019 DUML Community Science. Theme by Anders Norén. DUML Community Science is powered by WordPress at Duke WordPress Sites. Please read the Duke Wordpress Policies. Contact the Duke WordPress team.